No, not the trail drive television series, with the memorable theme song by Frankie Laine, that gave Clint Eastwood his start. Eastwood has nothing to do with this. 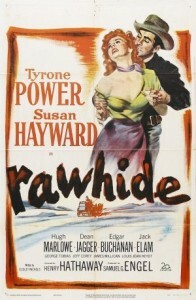 The title refers to Rawhide Pass, the stagecoach relay station where this movie takes place, as well as perhaps to a stagecoach driver’s whip. The geography doesn’t entirely make sense; Rawhide Pass is supposed to be about midway on the trip between San Francisco and St. Louis, but it seems to be perhaps in Arizona Territory from the references to Yuma and Tucson. There are references to the prison at Huntsville, which would seem to be Texas. Timewise, it’s before the transcontinental railroad, perhaps in the late 1850s. 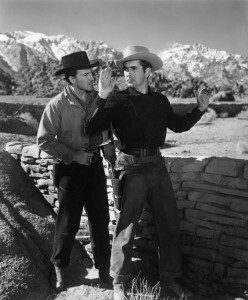 In any event, Tom Owens’ father is a big cheese in the overland stage line, and Owens (Tyrone Power) is at Rawhide Pass relay station to learn the business from old timer and stationmaster Sam Todd (Edgar Buchanan). Owens is not doing too well at it and can hardly wait to head back east in a week. The stage comes through, carrying among others Vinnie Holt (Susan Hayward) and a one-year-old baby, Callie. She’s heading east from the California gold country, but before she can continue her trip she’s forced off the stage by company policy. Escaped criminals from Huntsville Prison, led by Ray Zimmerman (Hugh Marlowe), have raided one stage and supposedly make it too dangerous for the baby to continue. However, waiting doesn’t help. The four criminals show up at the station, taking Todd, Owens and Holt prisoner. 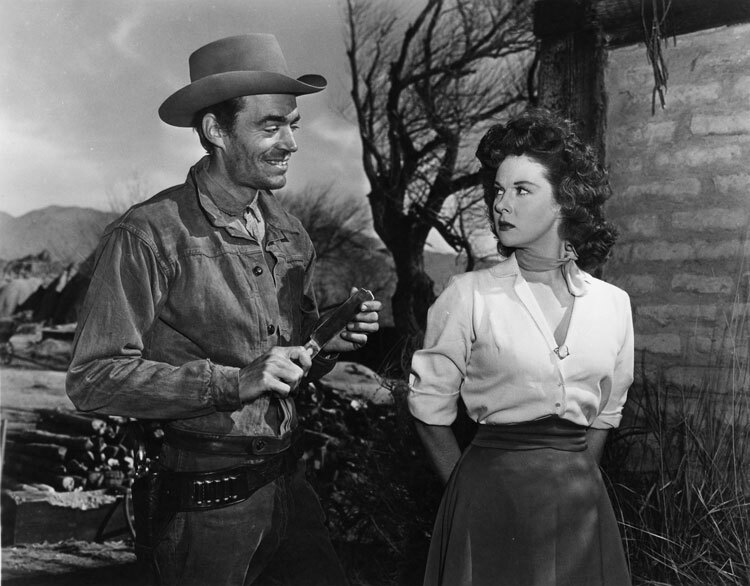 In addition to Zimmerman, there are Tevis (Jack Elam, in the juiciest role of his early career), a depraved killer crazed with lust for Holt; a German, Gratz (George Tobias); and a compulsive petty thief, Yancy (Dean Jagger). They plan to wait for the noon stage the next day, which they know is carrying $100,000 in gold. The gang assumes that Holt is Owens’ wife; they kill Todd early on. 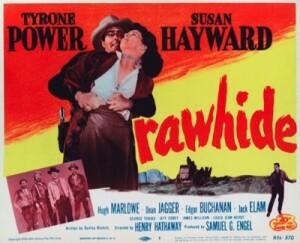 Owens and Holt try desperately to escape, with no success, and the gang members bicker among themselves. There’s a fair amount of character development, and developing tension as well. Ultimately Owens shows himself to have some character, and Holt may have fallen in love with him. In the climactic shoot-out, Holt plays the pivotal role. Owens’ pistol seems to have an inexhaustible supply of bullets, amazingly enough. 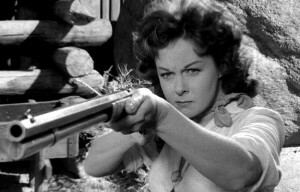 Susan Hayward is the most watchable actor in the movie, although Power and Marlowe are both good, too. At first we take her for a woman with a past, an unwed mother. But she eventually explains that the child is not hers but her sister’s. However, she seems to have a chip on her shoulder about it all. The claustrophobic feel, the black and white cinematography, and the focus on unstable characters in desperate situations make it seem noir-ish. The theme music over the opening credits by Alfred Newman had been used before, in 1940’s Brigham Young. Written by Dudley Nichols, who also wrote Stagecoach and The Tin Star. Shot at Lone Pine, in black and white, by Milton Krasner. Very watchable; better even than Garden of Evil, a good western which was also directed by Henry Hathaway with Susan Hayward. She wasn’t in many westerns, but there were at least three more: Canyon Passage, The Lusty Men and The Revengers. 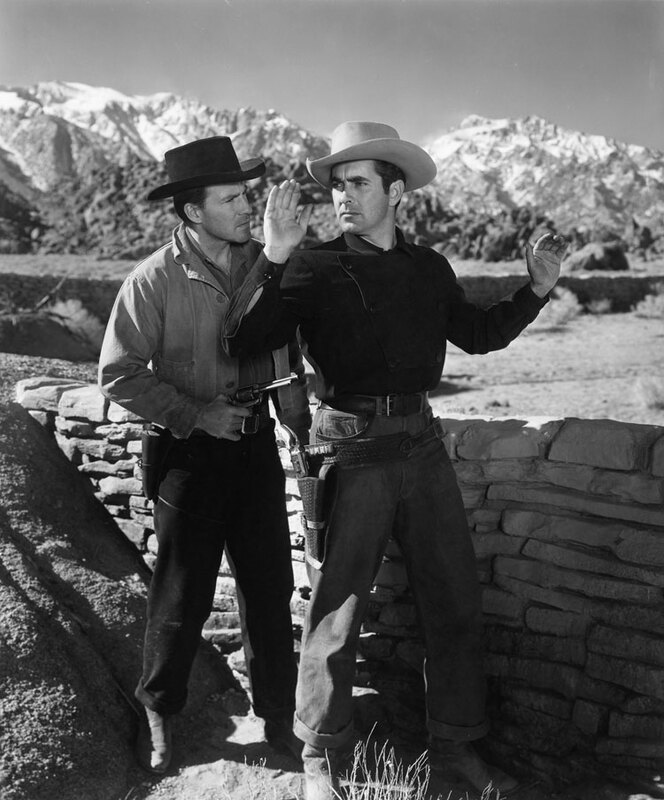 The situation of innocents held by bad guys has some similarities with The Tall T and Man of the West, as well as non-westerns The Desperate Hours and Key Largo. The DVD is available in a Fox Western Classics set with The Gunfighter and Garden of Evil, a pretty good deal on three pretty good westerns. 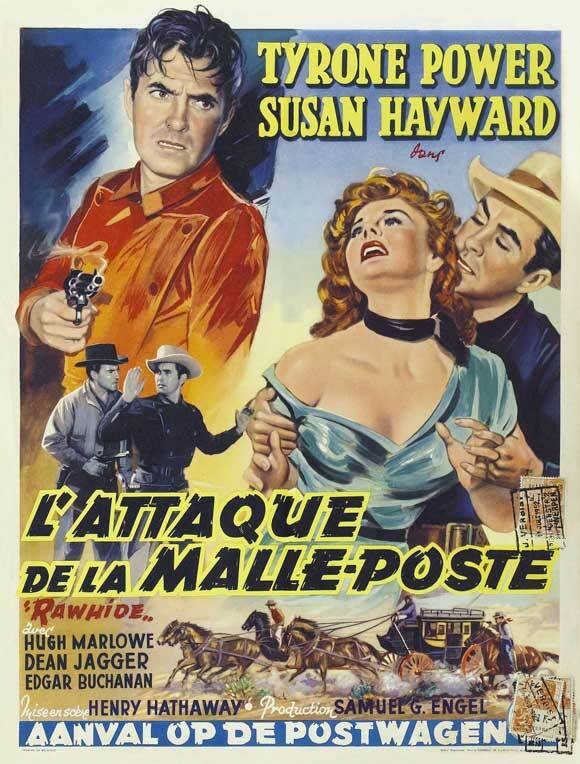 This entry was posted in Westerns Worth Watching and tagged Henry Hathaway, Outlaw Gangs, Susan Hayward, Tyrone Power, Westerns Noir on January 28, 2014 by Nicholas Chennault. Yeah, Elam is fantastic here. I noticed the thing with the bullets too, then remembered that earlier, when Vinnie took Owens’ gun she also took his gun belt, both of which would have been stashed behind the water trough. Might’ve been nice to see a quick shot of Power reloading though. More of a stretch is how well behaved the baby is throughout. She didn’t even need a nappy change!